On the outside the Edifier 1600TIII's look like a thoroughly traditional pair of bookshelf speakers although the three control knobs on the side and the remote control might give away the fact that these are powered speakers. These are designed for use with a PC but could be equally be used with an portable audio system. The main reaon for this is that unlike most modern pc speakers these do not use a USB plug for output but instead rely on traditional phono inputs. It is supplied with both a phono leads and a 3.5mm jack to Phono leads. The two speakers are linked together with a special cable you woudln't want to lose. Volume can be controlled with one of the side knobs or the supplied remote which is very useful. All of this would not be worth anything if they didn't sound good. On paper the specs don't put these in the high end of speakers but at around 90 GB pounds you wouldn't expect that. You probably woudn't expect them to sound as good as they do though. 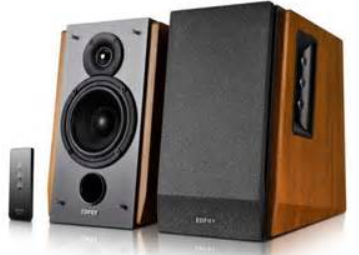 Edifier do some thoroughly modern magic with sound processing and whilst purists may not like they sound messed around it certainly seems to pay benefits here. The 1600TIII's are better their price would suggest and sound really good. Perhaps not the tightest bass but still reasonable and midrange and high end seem very precise. One trick is to keep the bass control in a neutral position. The electronics appear to be tuned for this position. Anything else sounds forced. In conclusion I really like these speakers they sound much better than the specs would show and are great value for money. As with all speakers I would advise auditioning these yourself but they are certainly well worth a try.